Last time out we talked about Non-Offensive Touchdowns and examined what teams with extreme positive or negative net non-offensive touchdowns can expect the following season. As I mentioned in the previous post, I calculated Net Non-Offensive Touchdown data for every FBS team in conference play during the eleven year period of 2005 through 2015. 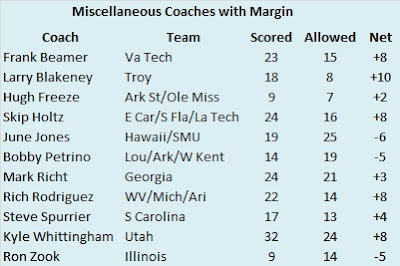 While compiling that information, I decided to create a leaderboard of coaches with the best and worst margins to see if certain coaches had a predisposition for good or bad results. Before we dive into the leaderboards, here are a few housekeeping notes. To qualify for the leaderboards, coaches must have been head coaches for at least five seasons during the sample. If a coach has a fantastic or poor net margin after a season or two, it is more likely this is just randomness or noise. If a coach has a similar net margin over a longer time period, it is more likely to be a demonstrable skill. In addition, sometimes coaches are fired midway through a season (shocking, I know). In the interest of making things easier on me, a coaches’ net margin for a particular season is assigned to the gentleman who began the year as head coach. No portion of the net margin is given to his replacement. Using 2015 as an example, Steve Sarkisian is credited with +6 even though he was the head coach for just a third of Southern Cal’s conference schedule. If you disagree, the data is freely available. Feel free to apportion the net margin as you so desire. Finally, the data is not broken down into different kinds of returns (punt, kickoff, interception, etc.). Alright, let’s get to the data. First up, here are the top-ten coaches in terms of positive net margin. I have also included their overall conference record as a reference point. The top three coaches by this metric have all won national titles since 2005. In fact, they have combined for eight of the eleven national titles won since 2005! 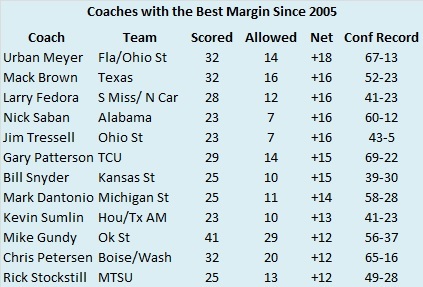 Every coach on this list is usually held in high regard by even the most casual college football observer. An exception might be Rick Stockstill who toils in relative obscurity at Middle Tennessee State. While his Blue Raiders are not a national power, they have posted a strong conference record in both the Sun Belt and Conference USA during his decade at the school. Based on the coaches who appear on this list, it makes sense that scoring and preventing non-offensive touchdowns could be a repeatable skill. Or at least emphasizing this tactic in scouting and stressing it in practice could lead to a positive margin over the long haul. What about the other side of the coin? Here are the bottom-ten coaches in terms of net negative margin. Once again, their overall conference record is included as a reference point. 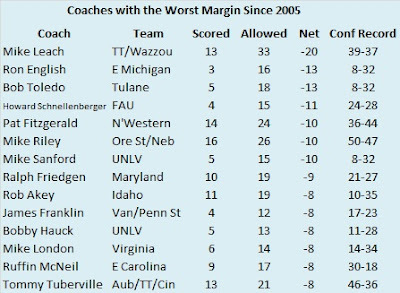 Whereas the positive margin list was a who’s who of great coaches, the negative list is more of a mixed bag. Certainly, there are good coaches on this list. James Franklin led Vanderbilt to heights many never imagined possible while Howard Schnellenberger built the Florida Atlantic program from nothing. Pat Fitzgerald and Mike Riley have succeeded at notoriously tough locales. Tommy Tuberville had a great run at Auburn (although his greatest success occurred before the period examined here) and Ruffin McNeill had just one losing conference record at East Carolina. Ralph Friedgen is one of the better coaches in Maryland history (although his fantastic start from 2001-2003 is not included in this sample). However, there are a few duds on this list. Ron English, outside of one outlier season, was mostly bad at Eastern Michigan, Bob Toledo could not recreate his UCLA success at Tulane, and Mike London somehow managed to stick around for six seasons in Charlottesville despite winning just 14 conference games. And for the love of all that is holy, please hire a special teams coach Mike Leach! There is more to football than the forward pass (and locking kids in sheds). So what conclusions can we draw from this? I don’t think it is a coincidence that every coach with a great net margin is highly regarded and considered among the best in their profession. Perhaps they have identified a market inefficiency and focus a disproportionate number of their resources (players, practice time, etc.) on scoring in unconventional ways. Perhaps they specifically recruit players they believe can score on defense or special teams. Or perhaps it is something else. Finally, I ran these numbers for all coaches since 2005, so here is a list of some miscellaneous coaches who failed to make either list. 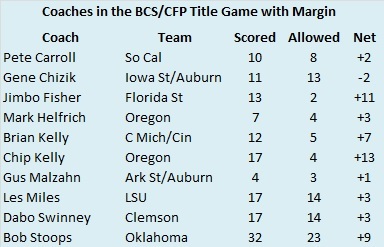 I included every coach since 2005 who either won a national title or coached in the BCS title game or CFP title game. Keep in mind Chip Kelly did not make the main list because he only coached Oregon for four seasons, narrowly missing the threshold for inclusion. I also included a few other coaches that I was curious about. If you have any specific requests, I will be more than happy to share them in the comments. Enjoy.